These are vegetarian tacos, which are my favorite kind of tacos. Alright, as some of you know, I have a brand new sourdough starter, Phoebe, and I’ve been using it in so many recipes. 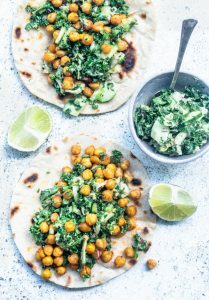 I threw some in my tortilla recipes, changed a few things here and there and came up with these amazing Sourdough Tortillas! Your starter doesn’t have to be active to make Sourdough Tortillas. Read more about it here. I end up using active starter many times, because I keep my starter on the counter, and therefore, it’s active a lot, since I have to feed it regularly. These Sourdough Tortillas are game changer. The sourdough adds a layer of flavor that just enchanted me! 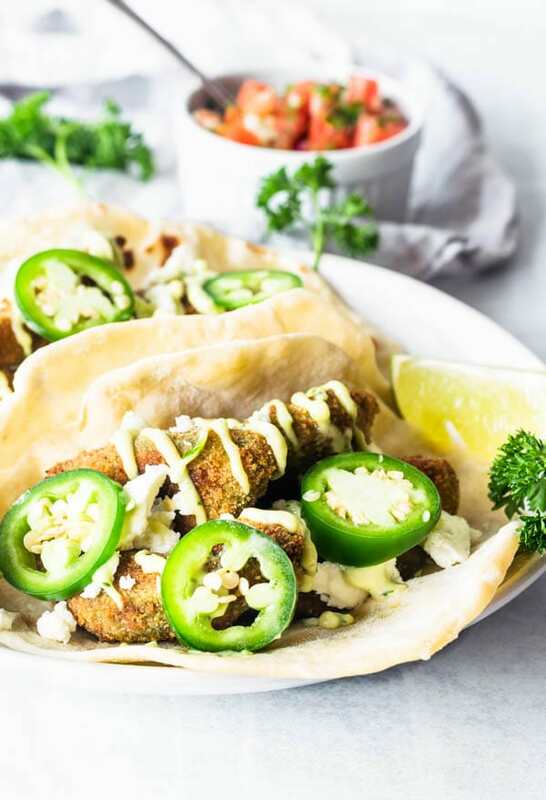 Now, let’s talk about these Avocado Fries, the main stars of these Avocado Tacos. My inspiration came from an awesome blogger, Emilia over at Breakfast Over Boys. Her version of these avocado fries was actually posted to her instagram page. Her version is gluten free and also vegan!! So so worth checking out. 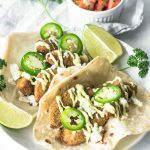 I made my version with gluten and not vegan, but that’s ok, because those were the ingredients I had and I really wanted to make these tacos! Emilia inspired me to put some garlic in my breading, and also to roast the fries, instead of… erm… frying them. And DUDE! They came out superb! So so crispy!!! Do check out Emilia’s feed on instagram, and also her blog! She is a source of inspiration for beautiful and healthy food! About the Jalapeño Garlic Mayo! Guys, it takes raw egg in it. If you don’t feel like making it this way, just use prepared mayonnaise and add the jalapeño, the cilantro, the garlic, and pulse a few times in a small food processor to combine. As a finishing touch, I sprinkled some farmer’s market Feta Cheese in my Avocado Tacos, because I had some in my fridge (when don’t I have feta cheese in my fridge?). They were bomb, they were awesome. I served them with some delicious pico de Gallo! I do love pico de Gallo, although my favorite salsa has got to be Mango! It was out of this world!! I could have eaten 5 tacos easily, but my self-control skills are out of control (hehe). 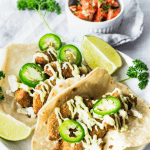 Check out some more Taco Recipes here. Here are my tortilla recipes: Sourdough Tortillas, Spinach Tortillas, and Flour Tortillas. 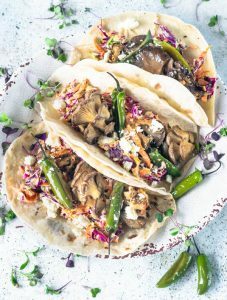 Vegetarian Tacos with Oyster Mushrooms and Serrano Chili Peppers. 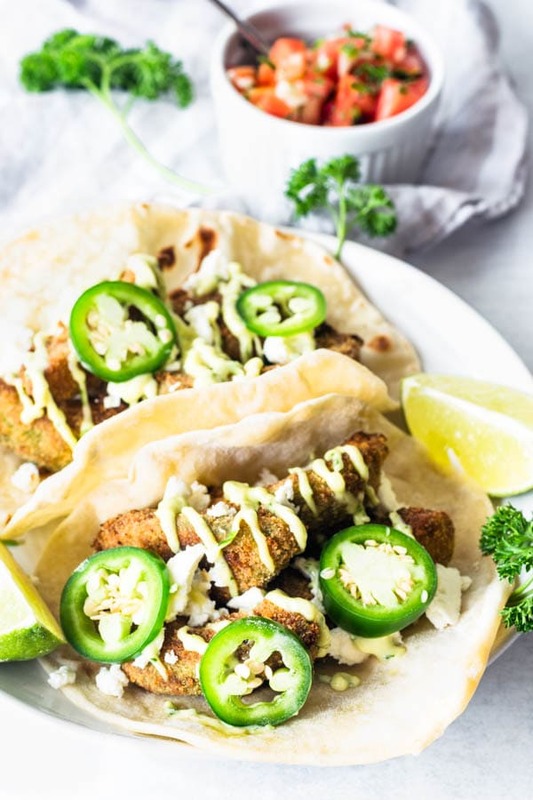 These Avocado Fries tacos are going to be a hit wherever you serve them. The Sourdough Tortilla is a step up in your homemade tortilla game! In a blender, combine egg, dijon mustard, salt, vinegar, paprika, garlic, jalapeno, cilantro and olive oil. Pulse a few times to combine. With the blender running, slowly drizzle canola oil in. Once canola oil has been combined, mixture should be emulsified. Store in the fridge until ready to use. Mayo will keep in the fridge for up to 2 days. Cut avocados in half, remove seed, and scoop out the whole flesh. Slice each half vertically into 2 or 3 slices, depending on the size of your avo. In a shallow bowl place all-purpose flour. In another bowl place beaten eggs and minced garlic. In a third bowl, place breadcrumbs. In a small bowl, combine salt, pepper, garlic powder and cayenne. Divide this spice mixture between the three bowls, the all-purpose flour, the eggs and the breadcrumbs. Dunk each avocado slice into the all-purpose flour first, then in the egg and finally in the breadcrumb. Drizzle a bit of olive oil (about 2 tablespoons) over fries. Place fries in the oven and bake for about 20 minutes. 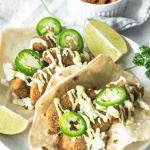 Warm tortillas, place avocados in the middle of tortillas, top with feta cheese, lots of cilantro or parsley, a generous amount of the Jalapeno Mayo, and serve! You can half the recipe for the tortillas if you don’t want to make 32 tortillas. They freeze beautifully. You can just wrap them securely in plastic and freeze for up to 2 months. Don’t forget to thaw them in the fridge for a couple days before it’s time to use them. Oh, how I love tacos! This recipe looks incredible. I definitely want to try this and I’m sure it’s very tasty! Thank you for sharing this great recipe! Yum! Thank you so much!! I appreciate your comment! 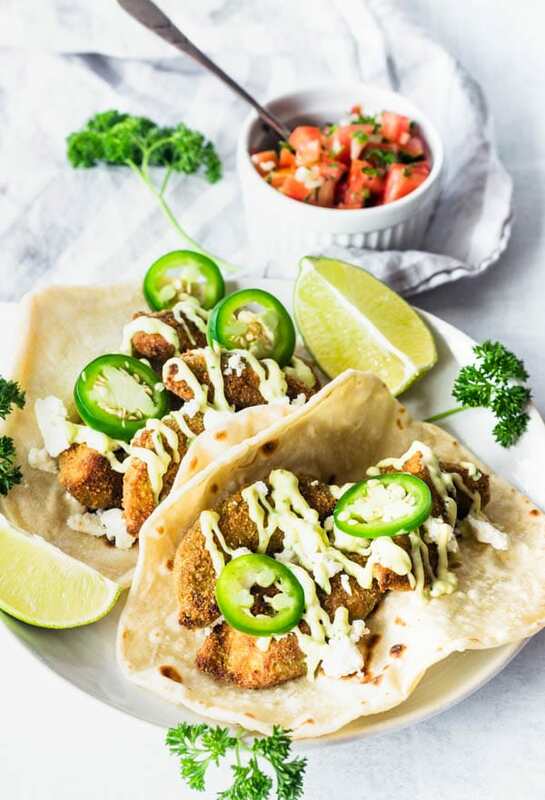 Omg that jalapeno mayo sounds amazing, definitely trying this! I hope you do, dear! I could eat this for lunch and dinner everyday and love everything on there looks marvelous! Now this looks like the perfect lunch to me! And loove the jalapeno homemade mayo! That mayo is truly the best, imo!! What a fabulous recipe idea! I’ve never heard of anything like this before and now I really, really want to try it! These look amazing, seriously. I adore salsa, and so I think I’d eat these with an assortment of different salsas and be in taco heaven. Yes, for sure!! Assortment of salsas is the way to go!! Hey, Thanks for sharing the recipe with us. Can I add some chicken in this recipe to make it more delicious? You sure can!! Go for it! It would be delicious to add some grilled chicken to this! You had me at Avocado! These look absolutely fantastic, and I cannot wait to make them!!!! Tacos and Avocados, what could go wrong?!?! Why have I not heard of a sourdough tortilla until. Let? Oh my goodness it sounds sooo stinking good! This recipe looks amazing, I wish I had seen it for Cinco De Mayo two weeks ago! Any day can be cinco de mayo if you really believe in yourself lol! Wow this sounds like a fabulous dish, I would never have thought to make fries out of 🥑 avocado. It’s very innovative. OH MY this looks amazing!! I have never thought of using sourdough tortillas, and it sounds absolutely delicious. And I like the sound of that jalapeño mayo too. Oh my goodness – this is genius!! Putting avocado fries IN a taco?! I also love that these are sourdough! Hi! Are you using active starter or discarded starter? Discard starter! Sometimes the starter I use it’s still kind of active because since I keep my starter on the counter, it’s active a lot, because I feed it regularly. But you can use the discard. I will change the recipe to include that! (ps. if you read the previous reply from me, I said active starter, but that’s because I thought you were referring to the sourdough bagels I posted today! So if you did read that, please ignore, the correct answer is discard! lol) Thank you, Amanda! Have a great day! !